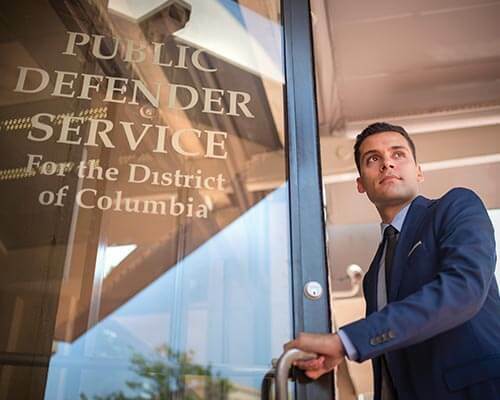 If Luis Medina learned one lesson during his summer legal clerkship with the Public Defender Service (PDS) for the District of Columbia, it would be that justice is not meted out equally without a strong defense. “A lot of times, people in the system are guilty of just unfortunate circumstances,” Medina said. Faye Bracey, the School of Law’s Assistant Dean of Career Services, said Medina shone as a top candidate for the prestigious position with the PDS because of his strong commitment to public service evidenced in his résumé. “Those interested in pursuing employment in the public interest sector need to be able to demonstrate a passion and understanding for public service, since in today’s market these positions are highly competitive,” Bracey said. For two and a half months, Medina worked on cases from burglary to murder, visiting the jail, visiting the youth services center where juvenile respondents are housed, writing motions and memos, interviewing clients and conducting legal research. Being a part of the defense team included going into the field with investigators to scope out a crime scene in the case of an alleged unauthorized use of a vehicle. Police claims about the incident did not add up once the investigators visited the site to measure distances, take photos and perform reconnaissance. “Working there definitely opened my eyes to the issues and the struggles people face when they are put into the system,” Medina said. “There are a lot of systemic injustices. I’m definitely keener on the idea of becoming a public defender.